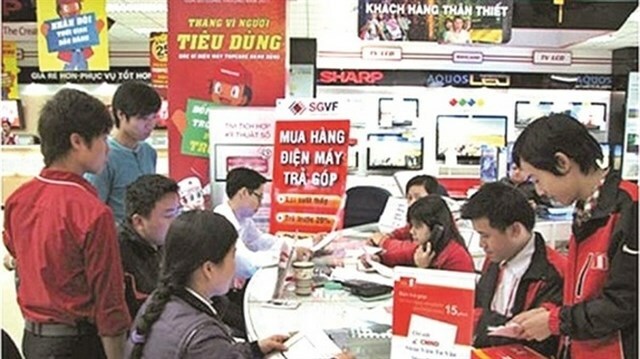 Hanoi (VNS/VNA) - Regulations on personal unsecured lending by consumer finance companies will be tightened if a draft circular of the State Bank of Vietnam (SBV) takes effect. Under the draft circular to amend the Circular No. 43/2016/TT-NHNN stipulating consumer lending by financial companies, the central bank proposes to limit unsecured personal loans – known in Vietnam as ‘cash loans’ – to existing customers with good credit history according to the internal regulations of the finance company and no overdue debt according to the classification of the SBV’s Vietnam National Credit Information Centre at the time of signing the consumer loan contract. In addition, financial companies must ensure to limit the maximum amount of ‘cash loans’ to 30 percent of their total consumer loans. In financial companies, ‘cash loans’ is one of the main products besides instalment loans and credit cards. Target customers of these product packages are more than 50 percent of the country’s population who do not have a bank account and have an average income of only 3-5 million VND (129-215 USD), depending on the requirements of each company. As explained by the SBV, ‘cash loans’ are at high risk of becoming non-performing loans as they don’t require collateral and declaration of borrowing purposes. With easy requirements and simple procedures, cash loans are an easy way to develop credit even though lending interest rates are much higher than those of banks. Therefore, to ensure consumer lending for sustainable, healthy and efficient development, the SBV said ‘cash loans’ should be limited to finance companies’ existing customers with good credit history and no overdue debt. According to business information provider StoxPlus, financial companies tend to shift to ‘cash loans’ and credit cards due to rapidly rising demand from people without bank accounts and low incomes while the form of instalment lending to buy cars and appliances at stores and retail shops has become saturated. Financial companies do not disclose the proportion of the cash loan segment in the total consumer credit balance but observers believe it would be significant. For example, in HD Saison, according to Viet Dragon Securities Company’s estimates, the proportion of cash loans in the portfolio is kept at 32 percent in 2018, compared with 41 percent of motorbike loans and 25 percent of loans for durable consumer goods. This rate may be even higher in new finance companies as they boost lending right from launch instead of jumping into fierce competition in instalment lending. For example, right from launch in October 2018, Easy Credit, a brand of EVN Finance, launched a loan package for customers with income from only 4.5 million VND. SHB Finance, launched in August 2018, also aimed at the cash lending market with a series of products for customers with an average income from 3 million VND. Besides regulations on disbursement forms for consumer finance loans, the draft circular also adds that financial companies cannot claim debts for organisations and individuals who have no obligation to repay debts. The new regulation is made as some finance companies have used strong tactics to recover loans, causing big concern among the public. For example, though not borrowing money from a finance company, a resident in Hanoi frequently received threatening phone calls from the company’s staff to ask for repayment. This was because when declaring a relative to borrow money from the finance company, a borrower used the resident’s phone number when he in fact didn’t know the borrower. The draft circular also states the loan contract will not include threatening measures for borrowers as many people said some consumer finance companies hired gangsters to collect debts. According to the Department of Competition and Consumer Protection under the Ministry of Industry and Trade, the sectors receiving the most complaints in 2018 were finance, banking and insurance. Of which, the complaints mainly related to consumer lending services of finance companies with many acts violating consumers’ interests such as providing inaccurate, incomplete and confusing information; not providing contracts for borrowers after signing; and recovering debt with threatening measures. Banking expert Nguyen Tri Hieu said though the proposed regulations would contribute to better controlling bad debts, it would cause the central bank difficulty in implementing its policy to fight loan sharks.